Fiona Harper is an independently successful travel writer, communications and social media manager and photographer whose words and images have been published in publications around the globe. Fiona’s combined skills in writing, social media, marketing and photography make her an exceptional story teller, whether working alone or in collaboration with travel media and marketing colleagues. Fiona Harper travel writer, content creator and digital media manager is the founder and wordsmith behind Travel Boating Lifestyle. An Australian travel writer with thousands of credits to her name, her articles and images are published around the globe. Much-travelled and with a reputation for producing results, she holds a coveted Google #1 page ranking for best Australian travel writers. Handy with a camera too, she developed Travel Boating Lifestyle in 2008 as a portal for publishing stories from her travels around the globe. An avid traveler and adventurer with a love for wild and remote places, Fiona’s most at home when she’s far from home. Stepping outside her comfort zone, she likes to get offshore and offroad to keep things interesting. Particularly if there’s the tantalising prospect of a tasty story to chase. 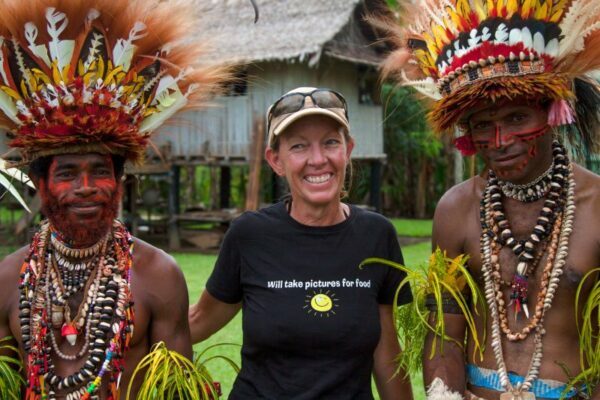 On assignment, she’s run marathons in Paris and Auckland as well as countless half marathons as far afield as Laos, Thailand and Christmas Island. Fiona hiked to Everest Base Camp (never mind that she succumbed to altitude sickness and was medi-vacced off Mt Everest – she got the story) and spent the best part of a year researching the world’s best mojitos (seriously…), slurping her way through the best and worst mojitos from Tokyo to Toronto. Her liver is still reeling. Fiona has bunkered down in ridiculously plush beds in luxe hotels slept in by royalty and rock stars (yep, she’s peed and pooped in the same toilets as A list celebs – oh the glamour of this job! ), camped under the stars on the Great Barrier Reef and slept on innumerable aircraft, trains, ships, buses and benches while on assignment. She’s perfected the art of sleeping standing up while waiting in a check-in queue. Her much-thumbed passport reads like War & Peace. Hiking the tundra with polar bears in the Canadian Arctic is a definite career highlight. So too was cruising around Cape Horn twice in the same week after popping over to Argentina for lunch. As you do… A lowlight was the time she missed the first flight of a complicated itinerary jigsaw which meant it took four days in transit, (she’s not proud of the accompanying tears and tantrums) to get home from Nova Scotia to Australia. A story teller whose best work emerges from the tropical regions, Fiona Harper and Travel Boating Lifestyle rarely venture into near-freezing latitudes. Unless there is a great story to be told. Or polar bears. We’ll travel anywhere to get up close and personal with polar bears!